The earliest Ammonium Chloride was invented in 1884 by the German , made from ammonia and hydrochloric acid. In order to improve the utilization rate of raw salt in soda production , China's famous Chemist Hou Debang successfully created soda and Ammonium Chloride dual manufacture process in Sichuan in 1943. This laid the foundation for mass production. 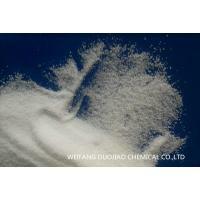 Used as medicine intermediate and phase transfer catalyst. Net in PP or PE bag. 25kg / bag , one 20'fcl can load 25 tons. Load and unload carefully and protect from package damage. In the event of a fire , use water , soil or carbon dioxide fire extinguishing media. Store in a cool , dry and ventilated house away from moisture. Avoid handling or transporting together with acidic or alkaline substances. Prevent the material from rain and insolation. 1. Full experience of large numbers containers loading in Chinese sea port. 2. Fast shipment by reputed shipping line. 3. Cargoes together with container sales service available. 4. Cargoes photo before and after loading into container. 5. Raw materials from chinese origin. 6. Packing with pallet as buyer's special request. 7. Best service after shipment with email.